Since its inception, the SA Department of Agriculture has provided information to South Australia’s householders and home gardeners about the growing, storing and use of fruits, vegetables and other foods. During early development of the state, successful home growing and use of produce was vital to both urban and rural households. This knowledge was essential for survival of families and prospering of the community. From settlement of the state to the mid 1950’s, most farms had a kitchen garden, and many urban houses had a large yard with room for a productive garden. During the 1880’s, the Agricultural Bureau played a key role in fostering development of home gardens by farming communities. These were essential for survival of early farm families. A feature of many Agricultural Bureau meetings was the exchange of gardening information along with vegetable and flower seeds. The Women’s Agricultural Bureau was also a key network for exchange of information about the use of home grown fruits and vegetables. “Fruit Preserving for Domestic Supplies” by George Quinn, Bulleting No 16, 1905. A detailed summary of fruit preserving equipment and processes to be used for different fruits and vegetables. “Fruit Drying for Beginners” by George Quinn, Bulleting No 31, 1912, provided detailed diagrams and information about establishing a small scale home fruit drying operation. At the 1906 Royal Adelaide Show, the Department of Agriculture mounted a comprehensive display to inform the public about fruits for drying, bottling and cold storage. During this early period, district horticultural advisers and inspectors handled inquiries from home gardeners as part of their normal duties. Through the first half of the 20th century, they wrote a steady stream of bulletins and Journal of Agriculture articles for home gardeners. With the Department of Agriculture established its head office at 133 Gawler Place in 1951, opportunity existed for establishment of a dedicated phone number and inquiry office to handle the steady stream of telephone, correspondence and personal inquiries being received from home owners. In the mid 1950’s, a regular roster of horticultural researchers, advisers and technical staff were assigned to man the home gardens inquiry desk. A range of simple publications were assembled to handle the “frequently asked questions”. Mr Bob Cowley, Manager of Blackwood Experimental Orchard played a key role in coordinating these service rosters. At this time, major fruit fly outbreaks were occurring in Adelaide (the first outbreak occurred in January 1947). Home gardeners were important allies in the Department of Agriculture’s program of eliminating fruit fly from the state. Home gardeners helped in identifying new outbreaks of this major pest and minimising its spread across Adelaide. The home garden advisory service was an important contact point and provided support for fruit fly eradication programs. This early Advisory Service also dealt with many requests for weed identification and control in home gardens, particularly turf. As many as 400 weed queries were forwarded annually, with specimens being sent to Government botanists for identification. This source of samples provided knowledge of the arrival of new alien plants which had the potential to become commercial weeds. 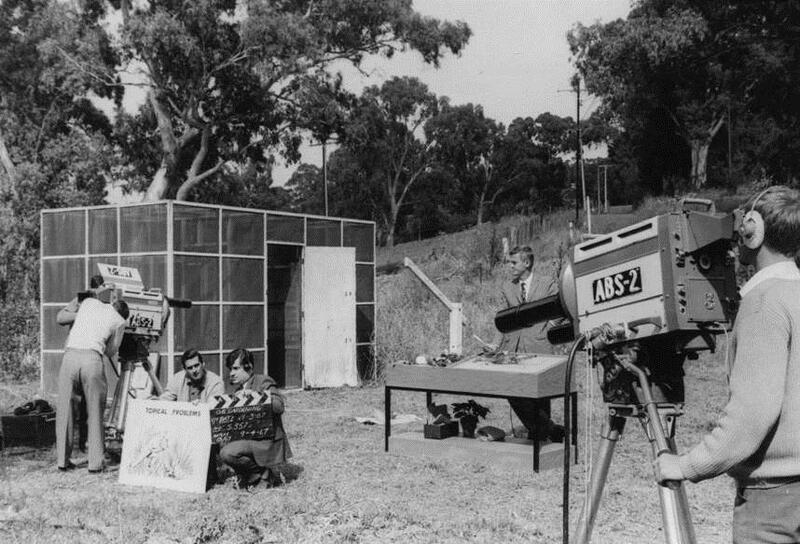 Filming a home garden TV program – Blackwood Experimental Orchard, 1967. By the early 1970’s, this informal home gardening inquiry service had become the main “clearing house” for the increasing number of public inquiries being received by the Department of Agriculture from urban residents. However there was concern that it was taking horticulture technical and advisory staff away from their principal tasks. In 1976, the Department of Agriculture moved into its new headquarters at the “Black Stump”, 25 Grenfell St, Adelaide. This provided an opportunity to establish a dedicated Home Gardens Advisory Service. This initiative was influenced by the increasing emphasis on serving urban communities being advocated by Premier Don Dunstan at the time. A dedicated Home Gardens Advisory Service was established within Extension Branch. It embraced the garden advisory services previously provided by Horticulture Branch and added a general reception and information service for the whole of the Department of Agriculture. Initially it was strategically placed on the ground floor level of the Grenfell Centre building for ease of public access. Later it was located on the 15th and 20th floors. The new Home Gardens Advisory Service was established with a team of three advisers managed by Barry Philp with support from Bruce Morphett, Keith Williams and various administrative staff. Later, advisers Brian Taverner and Ildi Bakonyi worked in the team. Preparation of a comprehensive set of fact sheets, booklets and information on home growing, processing, storage and use of fruits, vegetables and herbs. Some such as the fact sheets on home drying fruit were eagerly sought by the public and required print runs of several thousand every year. Weekly columns in the gardening section of “The Advertiser”. These seasonally focussed articles were about growing various fruits and vegetables, soil management, as well as dealing with various pests and diseases. This series of articles were published for a decade from 1979. Participating in “talk back” gardening programs on ABC radio, and preparation of ABC television gardening programs. These sessions were a forerunner to the wide range of gardening programs now seen on commercial television. Delivering “home gardening” presentations to a wide range of community and service groups, especially in rural areas. Displays and demonstrations at the Royal Adelaide Show, major country shows, and large regional shopping centres. During the late 1970’s, the Department of Agriculture had a major program of home gardening and home economics displays targeting the broader community. These used a large dedicated display caravan and marquee, and extensive display equipment. The Home Gardens Advisory staff teamed with Home Economics, Agricultural Bureau and Rural Youth staff in Extension Branch to deliver these displays and initiatives at major shows. Educating the public about the exciting ways to use the expanding range of new fruits and vegetables grown in home gardens and commercially was an important combined role of the Home Economics group and the Home Gardens Advisory team. The Department of Agriculture was servicing home garden inquiries associated with fruit, vegetable and other food crops, while the Adelaide Botanic Gardens was servicing home garden inquiries associated with ornamentals, native plants, flowers, landscaping and turf. Clearly there was significant overlap between the two services. Following several staff retirements, and with the Department of Agriculture rationalising to a stronger focus on commercial growers, the decision was made to amalgamate its home garden advisory service with the Botanic Gardens Advisory Service. From July 1989, Bruce Morphett was transferred across to become part of what was to become the Adelaide Botanic Gardens 4 person home garden advisory team. Adelaide Botanic Gardens continued to maintain a home garden advisory service to gardeners until October 1996. At this point, a review came to the conclusion that a garden advisory service was not core business for Botanic Gardens, and was replaced by a gardening seminar program which ran from spring 1996 to autumn 1999. From the spring of 1996, the free Botanic Gardens telephone service was replaced by a privately funded Home Gardens Advice and Helpline which ran until spring 2001. This used a dedicated 1900 phone number and charged users by the minute, and was promoted on the Gardening Australia TV program. Today advisory services to home gardeners are provided through a wide range of gardening magazines, radio and TV programs, along with services from nurseries and garden stores. This article was prepared by Barry Philp, former Senior Home Gardens Adviser Manager, with assistance from Bruce Morphett, former Home Gardens Adviser. During the period 1976 to 1989, the Home Gardens Section published a huge array of factsheets, bulletins and booklets on a wide range of gardening topics. In addition to these home gardening topics, more than 50 publications about storing and using fruits and vegetables were produced by the Home Economics team and other technical staff. Below is a list of home garden publications produced in the period 1976 to 1989. These can be accessed at the Woolhouse Library at the Waite Institute. FS 27/82 Mushrooms – nice to eat but are they safe?